Pipelines are where work finds definition in Streak. If your process isn't a perfect fit for our templates, you'll want to customize the pipeline to match your exact business and workflow. You can rename a pipeline by opening the pipeline and clicking its existing title in the toolbar. Pressing Enter or clicking away will save the name change. Each pipeline has a set of stages that follow a linear path from left-to-right. A pipeline for your sales team may flow from Lead, to Demo, to Negotiate Deal, and lastly to Closed Won. There's more than one road to close a sale, though, and customizing the stage-flow is the first step in getting your pipeline in order. The Stages option in the three-dot More Info toolbar option. Select a color theme for your pipeline. This theme is applied dynamically as you add and remove stages. 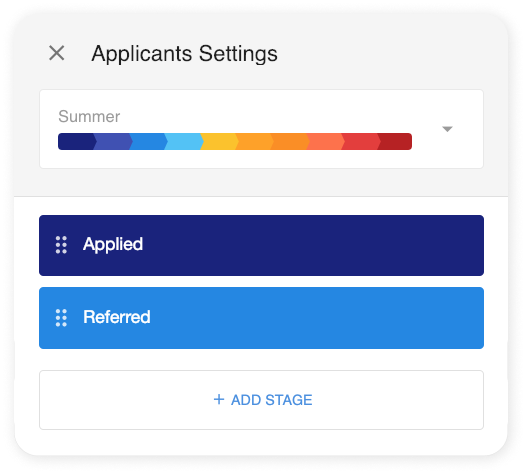 Add stages to your pipeline from the + ADD STAGE button at the bottom of the sidebar. Rename stages in your pipeline by clicking onto the text of the stage. Adjust the individual stage color by hovering over a stage and selecting the pallete icon. Delete a stage by hovering over a stage and selecting the trash icon. Pipelines, similar to spreadsheets, are made up of rows (boxes) and columns. Columns track the individual data-points that make up a box. Streak will provide you with a handful of columns to help get you started, but customizing those to match your process will help you and your team use Streak more effectively. Foundational columns – these are the basis of every pipeline and cannot be removed or renamed. Foundational columns are: Name, Stage, and Notes. Custom columns – these are customizable columns. They can be modified and formatted to magic your exact needs in a pipeline. Magic columns – these columns can be added and removed from a pipeline, but their data reflects insights about your box that Streak derives from the data you've added to it. You can create a new column by hovering over the circular + button in the toolbar and selecting Column, or by right-clicking on an existing column header and selecting Insert Column.